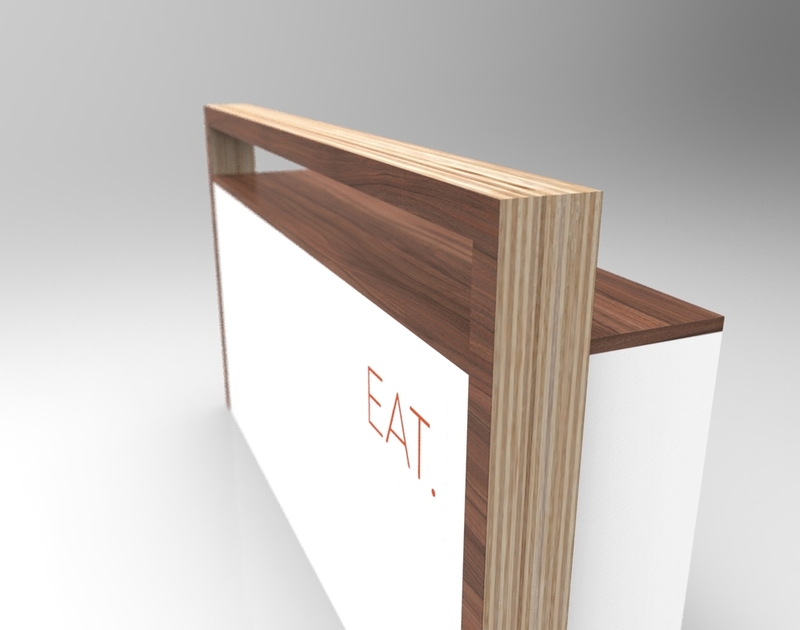 During a practicum with woodworking company Oliver Apt., I was given the opportunity to design three bars for the new Host Edmonton food and drink show at the Shaw Conference Centre. The shows objective is to introduce people to new recipes, drinks, and other forms of hosting. A major part of this is to provide an educative experience for the participants. I designed the bars to have a lofted platform where the participants can see and be involved in the process of what's being created, rather than traditional bars which create an obvious division between the creator and the person receiving. The bars integrate the Host Edmonton's tagline "Eat. Drink. Think." with a minimal type on the upper corners of the bar, communicating what the focus of each bar would be. dimensions: H 46" . W 65" . D 19"